A native to Europe and Asia and now naturalized to North America, Self Heal is commonly found growing beneath our feet. Also known as All Heal and a member of the mint family. 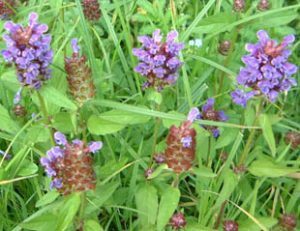 Self Heal’s mucilagenous quality makes it great as a “Barefoot Medicine;” it can be picked and directly applied to a wound. In fact it is considered one of the most reliable plants for wound healing working by drawing out heat and infection. In Europe, Self Heal was traditionally used for tonsilitis and has also been beneficial for dental decay. All Heal is also nourishing and building to the kidneys and in this way improved urination. Traditionally it is the upper parts of the plant that is used fresh or dry and can be made into a tea, tincture or oil and salve.